This Demonstration shows how the antenna pattern (intensity variation as a function of angle) of a ground-based laser interferometer gravitational wave detector changes with the frequency of the gravitational wave. 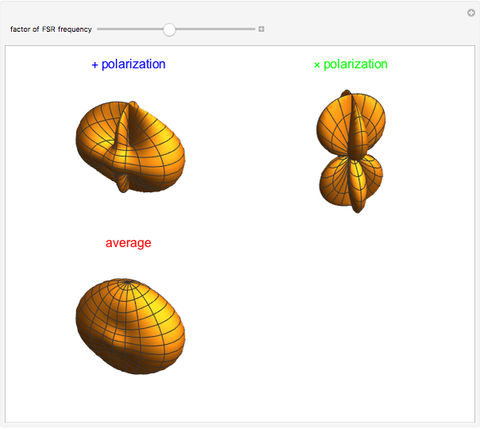 You can change the multiplicative factor to the free spectral range (FSR) frequency to see the three-dimensional antenna pattern for plus, cross, and average (root-mean-square) polarizations. The antenna pattern of a laser interferometer ground-based gravitational wave detector (such as LIGO) is often described as the standard "peanut"-shaped plot. This pattern is valid only for the long wavelength (low frequency) limit of the gravitational wave. But when the wavelength of the gravitational wave is comparable (higher frequency of gravitational wave) to the length of the Fabry–Pérot cavity of the interferometer, then the pattern changes. The first free spectral range frequency for the LIGO detectors is 37.5 kHz. Extra nodal directions can appear at high frequency. M. Rakhmanov, J. D. Romano, and J. T. Whelan, "High-Frequency Corrections to the Detector Response and Their Effect on Searches for Gravitational Waves," Classical and Quantum Gravity, 25(18), 2008. iopscience.iop.org/0264-9381/25/18/184017. D. Sigg, "Strain Calibration in LIGO," LIGO public DCC T970101. dcc.ligo.org/cgi-bin/DocDB/ShowDocument?docid=28842. Satya Mohapatra "Antenna Patterns for a Laser Interferometer Gravitational Wave Detector"